As thousands of young people up and down the country fight the government's education reforms, Cristina Delgado Garcia and Luke Yates outline some of the myths about the fee increases and the cuts, and explain why the government’s attack on universities needs to be resisted. In the biggest shake-up to the university sector since grants were introduced in 1962, the new government are tripling fees and cutting public funding by 40 per cent. Arts, humanities and the social sciences will be hit even harder, and many will face departmental closures. Universities that cannot ‘compete’ for high enough student numbers will be allowed to close, in another turn of the screw in the transformation of higher education into a commodity subject to the laws of the market. The government claims these plans won’t affect participation, that the cuts are ‘fair and progressive’, and that they make social and economic sense. Fact: Educating a graduate actually provides a profit for businesses and the taxpayer. The concept of ‘fairness’ has been appealed to repeatedly since the first cuts were announced in October. One of the two ways it is being abused to justify the increase of fees is through the argument that since graduates are the main beneficiaries of a degree, they should pay for it. On inspection this is not only an incredibly blinkered and individualistic way to value education and the production of knowledge, but also economically unsound. The idea of the public ‘funding’ higher education in tax is itself something of a myth – university graduates, through higher income tax contributions, are an incredibly high-paying investment. Statistics show the profit for funding a graduate, through social contributions and tax, average $89, 000 (£56, 000) over a life-time’s earnings. In addition there are benefits to society from funding education which cannot be quantified economically: better understanding of culture – ours and that of others – and of society. These benefits rival the enormous economic tax returns received from graduates, but they remain ignored by government, policy-makers and vice-chancellors if public goods are identified solely by wealth ‘created’. Secondly, it is considered fair that higher earning graduates should repay their student debt on higher interest rates for other graduates. Under these plans it is true that people on higher incomes would pay a proportion more of their fees than the poorer, as the government proposes to make it impossible for richer graduates to immediately pay off their debts more quickly and avoid higher interest rates. However, if the government were really committed to ‘progressive’ politics they would surely commit to other ‘progressive’ measures: a more ‘progressive’ tax system along the lines of the Scandinavian model; a bank levy to protect the poor from the whims of the bankers; and/or a proper increase in capital gains tax in order to discourage housing speculation and overvalued housing bubbles. The restructuring of university funding is fundamentally unfair because it places the burden of funding on graduates who spend their lives making money for business and more than pay back the cost of their education through taxes. It would be progressive to not charge such a productive sector of society in the first place. A variable interest rate for repaying these enormous debts does nothing to address these concerns. Fact: The national debt is still lower than it has been for much of British history, and is still lower than many other nations. The truth is that the UK national debt is not as alarming as the government discourse wants us to believe, and that tackling the current budget deficit with aggressive cuts will not only damage quality of life but also the economy, in both the short and long-term. Currently national debt is around 70 per cent of GDP. This is certainly higher than it has been in the last decade. However, this is not particularly high when considered historically: the UK national debt remained well above the 100 per cent of GDP until the 1960s, and only since the 1970s has it consistently stayed under 50 per cent of GDP. Nor is it particularly worrying given the international scenario, as the UK has a lower national debt than economies such as Italy and Japan; countries with national debts around or over 100 per cent of GDP. In fact, the UK national debt is far closer to that of countries with solid economies, such as France. It is true that the UK’s budget deficit, meanwhile, has grown rapidly in the last three years, largely due to hundreds of billions of pounds in bailouts to the banking industry in the form of ‘quantitative easing’. But again, the current deficit does not mean drastic budget cuts are necessary. In fact, the lesson we have learned from other countries is that aggressive austerity measures can actually lead to a decrease in economic growth, not to mention the dramatic impact on society. In December 2009, Ireland slashed its spending in education, health and transport to rein in their budget deficit. One year on, the Irish economy has sunk into an even deeper crisis, with an unemployment rate rising to 14 per cent and a huge IMF bailout taking place at the point of writing. Fact: Universities not only produce more wealth than they take in, but the increase in the amount paid as student loans will mean the fees increase will not actually save any money. Many of the cuts proposed by the government are unlikely to save money, and higher education is a case in point. Despite being funded with a comparatively very low 1.3 per cent of the governmental budget, universities create 2.6 per cent of the country’s workforce and generate 2.3 per cent of GDP. The cuts to universities will cause significant job losses. Some institutions may fail and go bust altogether. These redundancies cost money in the short-term, and welfare costs will also rise. Meanwhile, money saved in subsidising courses and research will be required to fund the massive expansion in lending, with the Higher Education Policy Institute recently concluding that the government will be spending so much on increased student loans that increased fees will not actually save any money. Fact: Universities in the UK receive far less funding than most OECD countries, which have higher levels of student numbers. Meanwhile, vice-chancellors have been complaining for some time about underfunding, and until recently their target was the government, and for good reason. The UK government has been spending a modest 1.3 per cent of its GDP compared to an average across OECD countries of 1.4 per cent. The United States, despite huge levels of individual debt in funding higher education, spends 3.1 per cent, while Canada, Korea, France and Scandinavian countries all spend substantially higher proportions of their public money on universities (OECD figures). In summary, neither student numbers nor public spending on higher education in the UK are at unsustainable levels. If anything, targets for public spending on higher education and levels of university participation could be much higher. Fact: It will in fact be harder for British universities to compete internationally if the funding cuts go ahead. This mantra is repeated by government and vice-chancellors in a surreal and disingenuous smokescreen for their actual plans. By proposing enormous higher education budget cuts, from £7.1bn to £4.2bn, it seems unlikely that the necessity to raise the international profile of UK universities figures highly in government priorities. The cuts will further damage the performance of UK universities, which have already been suffering from public underfunding. The coalition’s disregard for the creation and preservation of world-class leading research institutions in the UK is even more painfully apparent in arts, humanities and social sciences, areas of knowledge to which the government has decided to virtually discontinue its financial support. What the government reform actually entails is a shift of the burden – and responsibility – for university funding and excellence from the public budget onto students. British universities will continue to require financial support to maintain and increase the impact of their research, their appeal to business research contracts and international students. However, it is uncertain whether students’ ‘investment’ in university fees will suffice to sustain the ‘world-class’ higher education, especially in seemingly less lucrative departments. The tripling of university fees becomes necessary to safeguard standards only under this government’s refusal to subside higher education as a public good. Fact: The proposals will affect student numbers by providing a disincentive to families not eligible for support. Government statements as well as vice-chancellors from Russell group universities – the UK’s equivalent of the Ivy League – regularly deny that huge increase in fees will deter potential students from university. 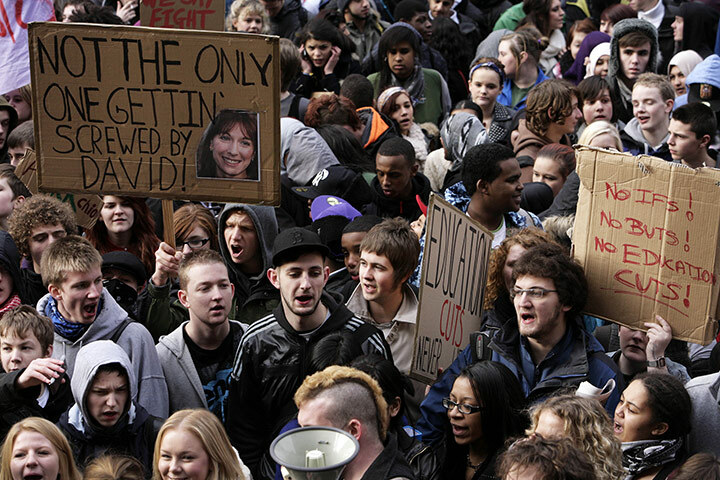 They claim that increases in student numbers since the 2006/7 introduction of top-up fees is evidence to the contrary. Closer analysis of the impact of top-up fees reveal a decline in participation precisely from those eligible to pay them. For poorer students (those below the median household income), the re-introduction of grants up to nearly £3000 alongside improved bursaries distributed by universities meant that there was no increase in cost or in debt levels. The numbers of the students who did experience these small rises in fees, meanwhile – those from the four higher social classes – declined from 43.8 per cent to 40.6 per cent in the year of the increase. This shows that even for the families most able to fund increases in fees even in the form of debt, the increases of around £1800 in top-up fees coincided with a significant reduction in access, despite the doubling of available loans. Increases of up to £6000 on top of these levels are therefore likely to impact very negatively on numbers of young people considering higher education, particularly for those with fewer resources to begin with. While overall participation levels have continued to increase despite the £3,290 fees that currently subsidise the government’s block teaching grant, this increase was made possible by the additional loans, grants and bursaries introduced at the time, as government research makes clear. There is no substantial equivalent package to lessen the impact of these new changes or protect prospective students from this increase in debt. A tiny £150m (coming from scrapping free school meals), will be spent on new scholarships. Education secretary Michael Gove has only provided reassurances for those paying the very most, announcing ‘we are going to ask the very best universities which want to increase their fees from £6,000 to £9,000 to come up with more imaginative ways to work with schools, but we won’t impose quotas”. Fact: People from poorer families tend to attend those universities that will suffer the most from the cuts. It is also worth pointing out the existing inequality in the UK’s student population. While 36 per cent of students currently attend university, the difference between numbers of students from the fifth most advantaged versus the fifth least advantaged areas is vast. 19 per cent of young people from the least advantaged areas went to university compared to 57 per cent from the most. This is actually a massive improvement since the mid-1990s but it masks a worrying story: that participation in the most selective institutions has not increased at all over the same time period. Increases have taken place almost entirely in the universities that require lower educational attainment, generally former polytechnics and others outside of the Russell Group. The government’s almost entire privatisation of university funding, meanwhile, and the ensuing competition Lord Browne expects to improve student experiences, are expected to mean the shutting of some universities and the expansion of other, more economically successful institutions. It is very likely that the institutions that will suffer will be those outside the core of the existing big, well-funded institutions – those that young people from poorer backgrounds would attend. The evidence shows that any system of bursaries and loans has little positive impact on the likelihood of poorer students applying to and attending these more selective universities. According to OFFA more changes need to happen at school-level to increase participation. In favouring the research-intensive Russell group selective institutions, the measures will produce bigger declines in participation from poorer families. There are clear alternatives to all the cuts and clear alternatives to the higher education funding changes. Examples from Europe and the rest of the world, both now and in the past, show governments have responded to economic crises not by slashing funding, but massively investing in universities. Alternatives like this recognise something of the social and cultural, as well as economic, worth of universities to society. The government’s statements are bland reassurances that mask a brutal attack on university education as a public good. We cannot allow them to be its epitaph.